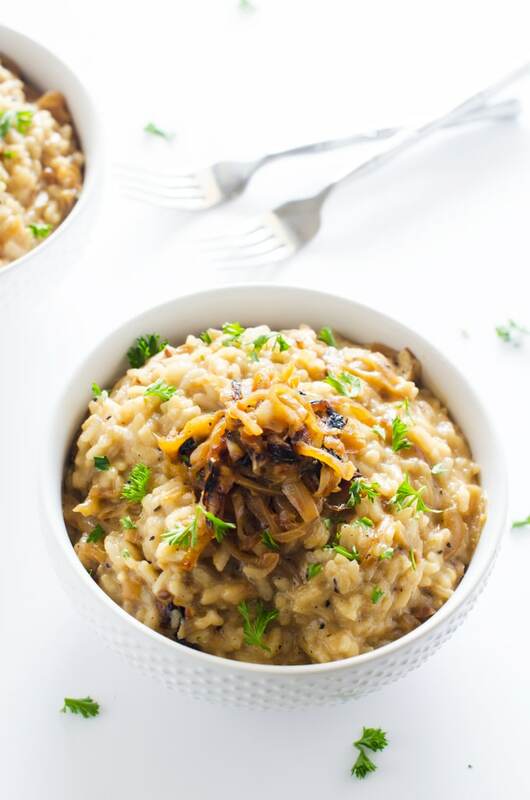 With caramelized onions, goat cheese and Parmesan cheese, this Caramelized Onion Risotto will blow you away! 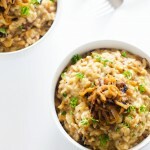 It is the best risotto recipe that I’ve tried. I mentioned in my last post that the New Year always gets me excited. I know a lot of people will make resolutions, only to find themselves disillusioned and disappointed in themselves in a few weeks. At this point, I haven’t pinned any resolutions or goals, but I do hope to take some time over the coming weekend to think about what I’d like to accomplish in the coming year. Regarding resolutions, I’m not going there. I’m trying a new approach. Instead of planning the whole year now, I’m going to make mini-goals for each month. I may jot down some changed I’d like to make and how I’d like to see the year go, but I also want to keep things open. That way I can look at what is working and what isn’t and adjust throughout the year. Having learned that perfection is a myth, this year I’m just focusing on making progress. My diet was atrocious the back half of 2015. Like – hasn’t been this bad for the entire existence of this website – kind of awful. So in January, I’m cleaning things up. That means even when I’m celebrating, I’m going to make an effort not to leave the proverbial reservation. I’m also going to try to get back to more plant-based meals. 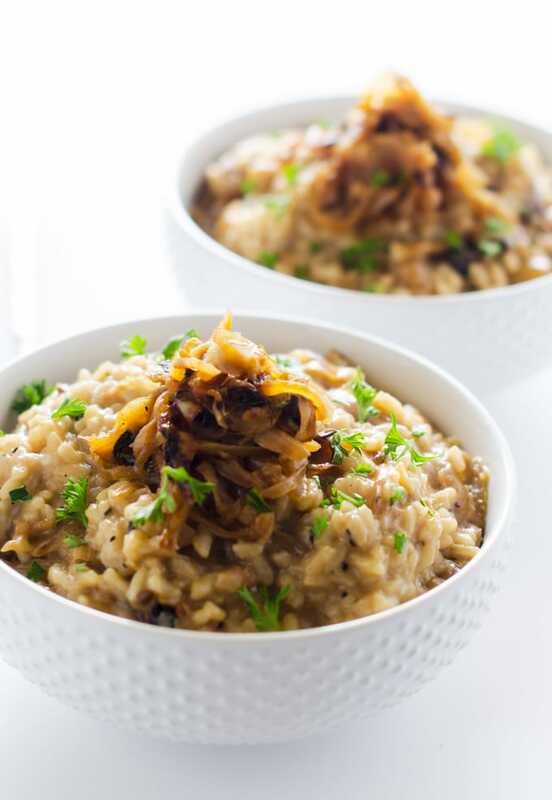 Today’s Caramelized Onion Risotto is a luxurious dish that is perfect for a celebration. (Like New Years Eve, Date Night or even Valentine’s Day. ) 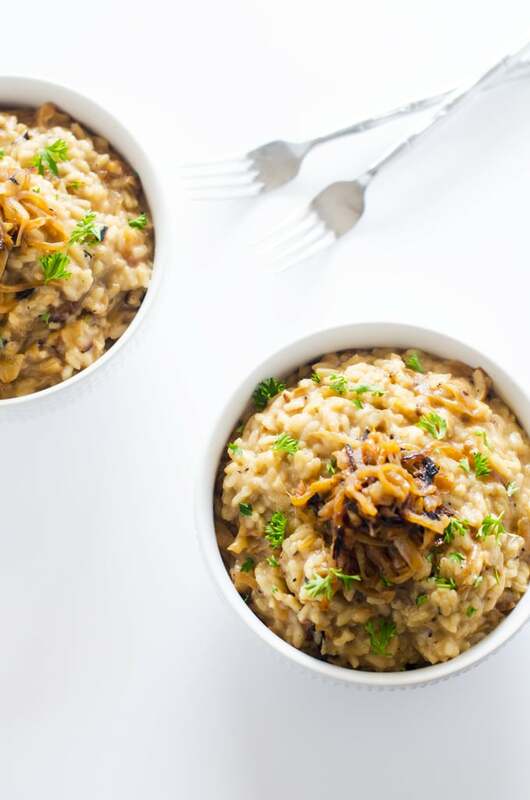 I like it as a vegetarian entree paired with an elegant green salad, but you could also easily serve it as a side dish. What are your plans for 2016? Are you making “resolutions”, setting goals or just taking things as they come? 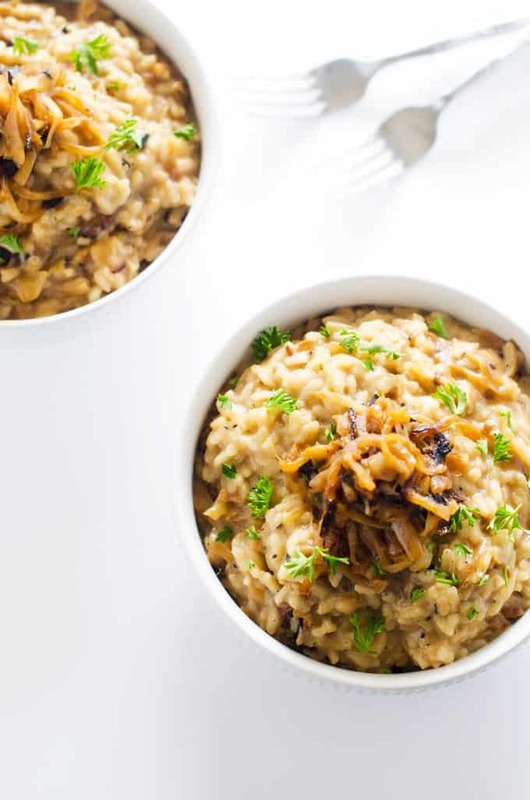 With caramelized onions, goat cheese and Parmesan cheese, this Caramelized Onion Risotto will blow you away! 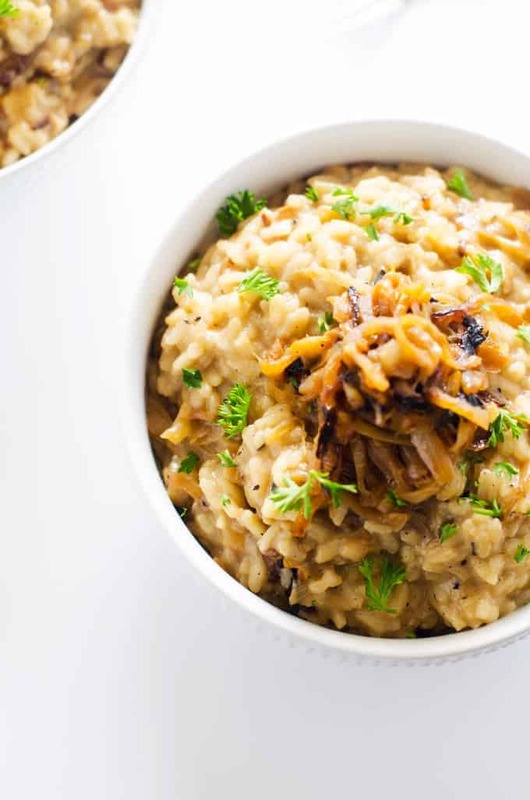 It is the best risotto recipe that I've tried. Heat oil in a large skillet over medium high heat. Add onions and cook for 5 minutes. Stir. Reduce heat to medium and cook, without stirring, until the pot begins to brown, about 5 more minutes. Reduce heat to low and add salt. Cook for another 30 minutes, stirring occasionally. Meanwhile, heat broth in a saucepan until hot. Transfer onions to a plate. Tent with foil to keep warm. Add 1/2 cup of broth to the skillet, scraping with a spatula to get up and bits on the bottom. Pour the liquid back into the broth mixture. Stir in cheese and all but 1/2 cup of onions. Salt and pepper to taste. Serve warm, topped with remaining onions. This was so good! Thanks so much for sharing.